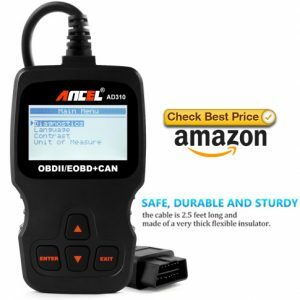 ANCEL AD410 Enhanced OBD II Vehicle Code Reader Automotive OBD2 Scanner Auto Check Engine Light Scan Tool. 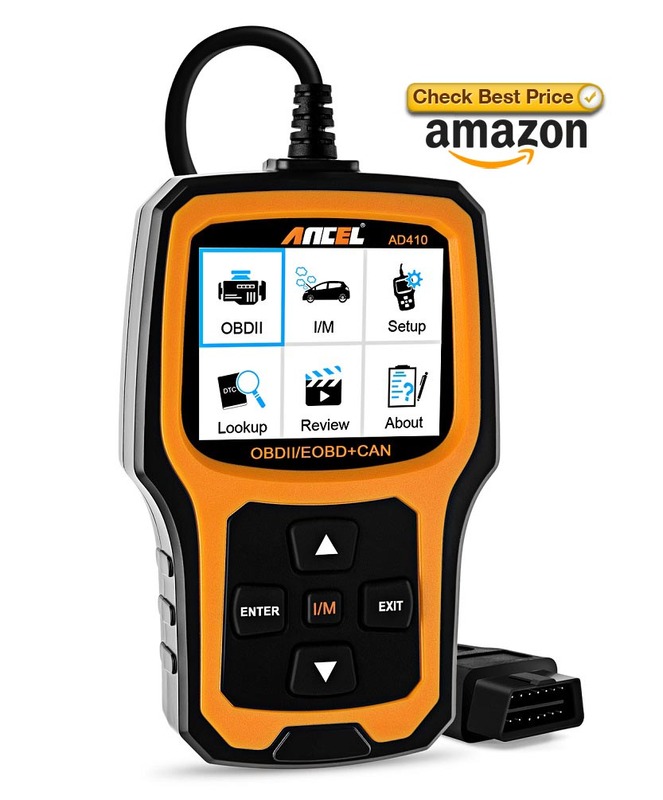 AD410 code reader is a great upgrade from the more basic diagnostic scan tool. It has a 2.4″ TFT true color (262K) LCD display which indicates test results more clearly. Here collect buyer frequency Ask Question when they buying Ancle AD410 scanner. Q1:Will this display maf values, engine rpm, and o2 sensor values? A2: Is Onda Accord 1998 EX V6 compatible? Q3:Hello, can you see transmission, abs, and srs live data with this scanner? A3:Hi, the major function of this scanner is detecting engine system, read and clear error codes. It can read live data, but it can not read transmission, abs, and srs. Q4: Do you have to pay for software updates if/when you purchase a newer vehicle? A4: Hello, you do not have to pay for software updates. It supports Lifetime Free Upgrade Online. Q5:Will the update program work via windows xp desktop? A5:I purchased this for use on my ’97 Ranger. It would not read it. It says it works on ’96 and newer. I returned it to Amazon. As for windows versions, I don’t know but it should work on XP. Q6:Work on 2004 toyota sienna? Q7:Why won’t this unit turn on? I just bought and recieved mine and it doesn’t seem to function at all. Q10:Does the tool provide the problem of the code? Q11:Will this work with a 2008 Ford F-250 with the 6.4 diesel ? A11:Hi, it will work on your 2008 Ford F-250. Q12:Will this work with a 2002 f250 diesel? will it also read abs codes? A12:Hi, the major function of this scanner is detecting the engine system, read and clear error codes. It can not read abs codes. A13:Hi, it is an OBDII scanner, so it should work if your car support OBDII protocol (16 pin port). The OBDII protocol was implemented in the United States in 1996, but does not guarantee all cars. Q14:I recently purchased this reader came packaged in just bubble wrap with no manual. Is there a manual or website that shows what all the functions are? Q15:Will this unit reset the airbag code in my 2004 minicoopet S? Q16:Where would i plug it into on my 2004 jaguar xj? A16:I can’t say for sure, but most likely on the driver’s side under the dash. Mine (Audi) happens to be on the left near the door by the hood release. I have seen others on the right near the center console. And for more details of Ancel AD410 FAQs,please check our shop on Ancel AD410 Amazon.